†Present address: International Business Machines Corporation, Monterey and Cottle Roads, San Jose, California 95114. 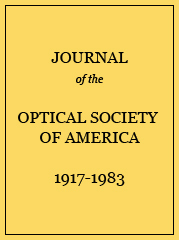 The general multiple light-scattering theory due to Hartel for the angular scattering from high concentrations of spherical scattering particles has been calculated for the case of large spheres. Experimental data for the multiple scattering for various volume concentrations of monodisperse polystyrene latex particles are compared with calculations of the theory. The results indicate that the theory as generalized in this paper is a valid general multiple light-scattering theory for fairly high concentrations of spherical scattering particles. Light-scattering coefficients An and Cn(k) for m = 1.20 and α = 15.0. Calculated Qk values for various volume concentrations C0 of m = 1.20, α = 15.0 particles. Equivalent δ/R and C0 for 2.89-μ-diam particles.